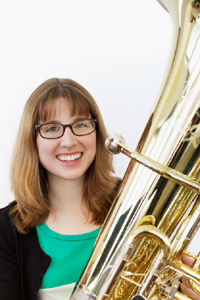 Beth McDonald is a classically trained tuba player gone awry. As a musician, she works mainly in the genres of electroacoustic music and contemporary classical music, but also performs jazz, pop, and anything else she can. Her solo CD, “Still,” features new works and improvisations for tuba with electronics. Beth received music degrees from New England Conservatory and the University of Kentucky, where she also studied political science. As a classical musician, she has performed with the Lucerne Festival, the Schleswig-Holstein Musik Festival, and as a soloist with the Johnson City Symphony. Beth also enjoys organizing concerts, assisting with community projects, and working with technology. In Boston, she was the Artistic Director of August Noise JP concert series, which brought unexpected music into public spaces. Over the course of four seasons, August Noise presented 29 concerts, giving over 115 local musicians a chance to engage with and give back to their community. Beth also helped to organize Make Music Boston 2014 – part of the annual, worldwide Make Music Day festivities. We are always on the lookout for outstanding piano, guitar, voice, and drum instructors. Apply now!